There is nothing quite as exciting as a rousing football match, don’t you agree? Even though as a youngster I was never a happy sideliner (put me in, gaffer! ), now I’m a fan of the spectacle. All of Munich is preparing for tomorrow’s match. In every square the game will be projected onto a bed sheet or screen. 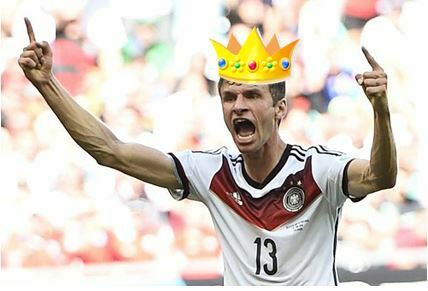 In Brazil I can almost see Thomas Müller sipping his Frühstück riesling. Devouring his sausage. And I am certain that Joachim Loew is right now putting extra polish on that hair of his (you know how important hair is to yours truly), so it behaves when he feels the urge to leap in the air. This past month, there has been plenty to set The Empress’s heart ablaze. Nothing pleases me more than gazing upon well-conditioned young men. I am already dreading the lack of entertainment come Monday morning. Though I’m solidly for my homeland, I must admit to a wee Empress crush on Argentina’s number 10. Sure, sure the fellow is short. Hardly the specimen of those individuals branded Germany’s “golden crop” : conventionally handsome Mats Hummels whose deep brown eyes and strong chin rival any movie star in Hollywood, or that all-around tough competitor Schweinsteiger who wins more balls than God. But it must be acknowledged, even by a fan of the Bayern golden crop, that Lionel Messi is pure heart on the pitch. All that said, whichever way the ball bounces tomorrow, at the end of the day we’ll have a new Man of the Match football king. Will he be a tall, precise German, or a crafty little acrobat? Either way, it’ll be a good show.